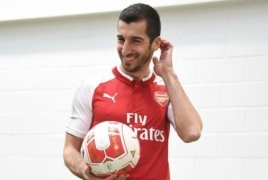 PanARMENIAN.Net - Armenian midfielder Henrikh Mkhitaryan was at the center of the good attacking play that Arsenal showed against West Ham, The Independent says. The Gunners got their first win under their new manager Unai Emery on Saturday, August 25. "Arsenal showed glimpses of some really good attacking play and Henrikh Mkhitaryan was at the centre of a lot of this," the article says. "The process is in motion and you sense that once it clicks Emery will begin to restore some pride at Arsenal." Following the Saturday match, the Armenia international praised Arsenal summer signing Matteo Guendouzi who made an excellent start to life with the Gunners. Mkhitaryan said he has been hugely impressed with the 19-year-old and believes he deserves his spot in the starting XI.